This family-friendly recipe is adapted from Cook’s Illustrated. Please note that the Prep time does not include the rising time - the hands on part of the recipe is easy, but requires patience! Place the water, sugar and yeast in a large bowl, and let sit a few minutes to proof. For best results, Scott and Katherine recommend weighing the flour and water rather than measuring them. Stir in the flour slowly, about a heaping tablespoon at a time. Once all of the flour has been added, knead well for approximately 10 minutes, either with a dough hook mixer attachment or by hand. The dough is fairly wet and won't get very tight. Let the dough sit for 30 minutes. Add the salt and gently knead the dough until it's incorporated. Brush the inside of a large bowl with 1 tablespoon of the olive oil. Put the dough in the oiled bowl, turn it over, cover with a clean dish cloth, and let it rise until doubled, anywhere from 60 to 90 minutes. Turn the dough over on itself, then let it rest for another 30 minutes. Turn the dough over on itself again, then let it rest for another 30 minutes. Brush four round 9-inch cake pans with 1 teaspoon of the olive oil each. Punch down the dough and place it on a floured cutting board. Cut the dough in half, then in half again, making four equal portions. Cut one of the four portions into eight equal pieces. Shape one of the eight pieces of dough into a ball by tucking the edges under the center. Place in the center of an oiled cake pan. Repeat with the additional seven dough pieces, placing them in the pan around the center roll like the petals of a flower. Repeat the cutting, shaping and placement with the three remaining large portions of dough and three additional cake pans. Lightly grease the tops of each pan of rolls. Spray oil is easiest for this step, but a pastry brush dipped in olive oil can be used. Cover the pans with plastic wrap and let rise for 30 minutes. Preheat the oven to 475ºF. Place a large roasting pan or 9x13 metal pan on the bottom shelf of the oven when preheating. Remove the plastic wrap from two of the pans, and place them on the middle rack of the oven. Quickly pour a half cup of hot water into the empty pan on the bottom shelf. 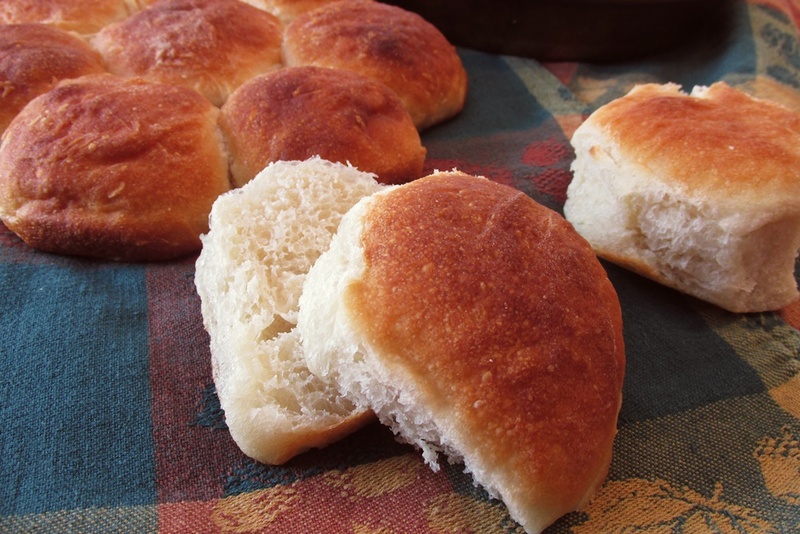 This job--for an adult helper—helps form a rustic crust on the rolls. Bake the rolls for 17 to 20 minutes until golden brown. Immediately remove the rolls from the pans to a cooling rack. Repeat the baking process with the remaining two pans. *You can optionally use a blend of white whole wheat and all-purpose flour, but at least half of the flour should be all-purpose. A tablespoon or two of ground flax seeds is also a nice addition!